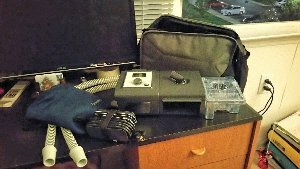 Complete CPAP Kit including device, user manual, carrying case, power cord and power supply, flexible tubing, 2 nasal mask (1 unused), reusable gray foam filter, side cover panel, sd card, humidifier, and water tank. Machine was only used twice and is an excellent condition. Cleaned and sanitized and ready for use.